Brian Michael Bendis made the Avengers cool again. He used a simple plan which is presented to the reader on every title of the past 7 or so years. Bendis created a "New" group of Avengers. Your father's Avengers of Thor, Captain America (the original) and Iron Man have had their combined stories told over and over. The years since their creation brought several more team regulars such as Hawkeye, She-Hulk and the Vision, but the stories up until Brian Michael Bendis largely centered around the Avengers Prime squad of hammer, shield and armor. When it came Bendis' time to put his mark on the Avengers he attacked the Avengers themselves and Disassembled the group. He killed off some characters and destroyed the group making way for the rebirth of the New Avengers. Originally when the Avengers came together in the 60's the group was formed of Marvel's coolest fan favorite characters. It was not only a super team in terms of power wise, but star power, as well. 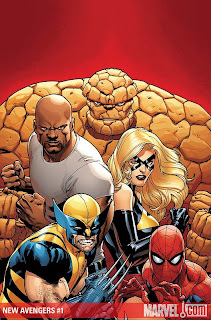 Bendis took this approach when forming his new Avengers team with favorites such as Spider-Man and Wolverine. 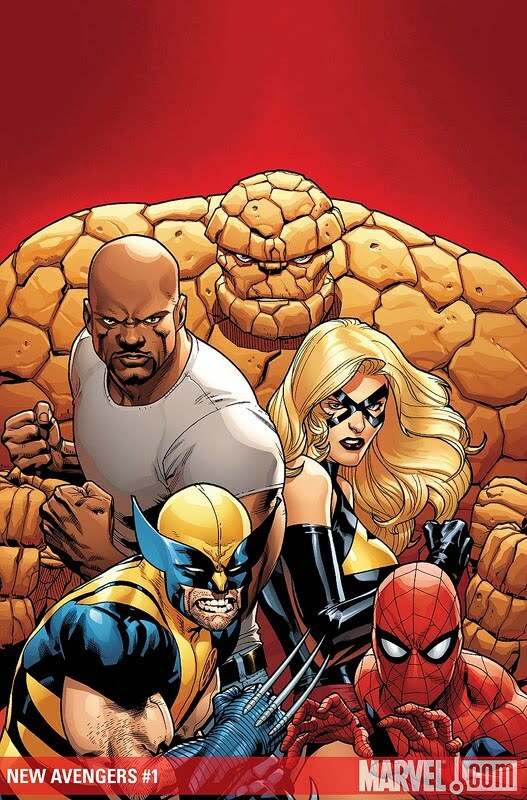 He brought on two of the original Avengers in Iron Man and Captain America to establish some tradition, but eventually separated the prime characters out completely ending up with a group which included Luke Cage, Spider-Woman, Iron Fist, Ms. Marvel, Hawkeye (brought back from the dead) and a couple more lesser known characters. Wolvie and Spidey were now the old school characters and Bendis breathed life into characters which hadn't been fan favorites in years...if ever. The new mix of heroes became so compelling to watch as that got through tough situations without the old experienced vet or genius. They relied on each other even when they couldn't rely on each other (Civil War and Secret Invasion) to get through tough times. The characters became so popular in The New Avengers that several of them have has spin-off titles: Hawkeye and Mocking Bird, the motion comic Spider-Woman Agent of S.W.O.R.D. and Luke Cage as the leader of the new Thunderbolts team. As The New Avengers starts up again with New Avengers #1, the likable family like cast is back and no longer on the run from the government. As a new adventure begins to unfold the reader is taken right back to the feelings of entertainment which Bendis always brings to the New Avengers stories, but the reader is also treated to more art by New Avenger experienced artist Staurt Immonen and the best colorist in the business Laura Martin. Immonen is perfect for a team book like the Avengers because he doesn't get overly detailed while still drawing flowing action sequences and handling iconic costumes such as Wolverine's, Iron Fist's and Spidey's with such great ease. His art is made to look perfect for The New Avengers #1 thanks to Laura Martin's colors. I love her use of a wide range of bright and bold colors on this book. The tones give the Avenger name a sense of majesty and wonder in the way a child seeing Superman close up for the first time may experience (sorry to cross publishers on you there). New Avengers #1, the comic of the day, has it all just as the New Avengers' title always has. Writing...check. Pencils...check. Colors...check. Dom continuing to buy every New Avenger issue Bendis releases...check.